DCist: WHFS, R.I.P.. Infinity Broadcasting changed the format of the venerable “alternative rock” station (which had in recent years largely shifted focus, to what DCist appropriately calls “aggro rock”) to a Spanish language station. This leaves the DC area with no alternative rock stations at all. New York Times: Modern Love for Ancient Vines in Southern Italy. The article provides an outstanding introduction to the viticulture of Campania, including all the usual suspects: Feudi, Mastroberardino, even Riccardo Cotarella. The article talks about the growing recognition of the importance of wines made with the indigenous grapes: aglianico, fiano, falanghina, and greco. 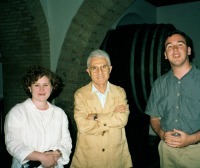 Now seems an appropriate time to post the pictures from our 2000 visit to Mastroberardino, including our meeting the Marchese (right). If there is a tab stop set, then inserts a tab character. The most common case where Word is likely to be wrong is case #3, so the auto-recovery feature in Word 2003/2004 allows you to convert the auto-formatted indent back to a tab. Key words being “most common.” I think this is the unavoidably maddening thing about all these autocorrect features—they apply the 80-20 rule. Nothing makes some people angrier than having their computer—where they’re supposed to be in control—make the wrong assumptions about what they’re trying to do based on what “most people” are doing. MacCentral: MWSF: iPod integration coming to Volvo, M-B, others. There’s no better indication that Volkswagen’s marketing team, once so good, is asleep at the stick. I want my Passat iPod integration kit, dammit! First impressions on the Mac Mini—brilliant. As others (including Glenn Fleishman) have noted, it’s essentially a slimmed down Cube, unapologetically at the bottom of the feature scale for a modern Mac but also at the rock bottom of the price scale. Of course, the “bottom of the feature scale” for a modern Mac isn’t such a bad place to be. With a 1.25 or 1.42 GHz G4 it can run pretty much anything you can throw at it. For PC switchers or someone looking to use this machine as a primary PC, I would definitely recommend upgrading the RAM to 512 MB. But for a lot of us, including me, the 256 that the base machine comes with would be just fine—to run iTunes and iPhoto as a headless appliance hooked into my network and my audiovisual system. And with that 6.5″ square footprint, it’s small enough to truly live in the living room. What limits that scenario is hard disk space. If the disk maxes out at 80GB—and can’t be replaced—it’s too small to hold my music. And it looks like it does—check out the images on the Design page and the TidBITS note on the Mini. But, as Glenn points out, you can always plug in outboard storage. Conclusion: Apple may have a winner here—not by addressing the spec heads but by paying attention to the Wife Acceptance Factor in the design of the product. New York Times: James Forman Dies at 76; Was Pioneer in Civil Rights. I read Forman’s book, The Making of Black Revolutionaries, during my History of the Civil Rights Movement class at UVA—taught by Julian Bond, Forman’s former SNCC comrade in arms, the class was easily one of the top three that I took there. And the book was a big part of the reason. Together with CORE’s Jim Farmer’s Lay Bare the Heart, Forman’s book planted a seed of radical liberalism in my heart—the sort of radical liberalism that says that you stand up to injustice wherever you see it, no matter how unpopular the stance may be. That you stand up for the rights of the oppressed especially when no one will let them stand up for themselves. That you speak out about civil liberties, because when you let them be infringed you destroy the premise and promise on which this country was founded.